Hey – Frockers out there!! Fancy a movie? Join me and other Frockers for The Little Black Dress Ride! Yes girls – gets those LBD out of the back of the wardrobe, get those sewing machines out, search out the second-hand shops or visit Trade Me ( a favourite internet site of mine – for those much loved Little Black Dresses! Have organised it for Sunday 15th July – meet at the car park on Harding Rd, Napier, opposite the Milk & Honey Cafe, next door to the Cool Cat Ice Cream Parlour at 10.30am. Set off for a bike ride to work up an appetite for lunch at one of the many bars/restaurants in Ahuriri, before heading off to the movies at the Globe Theatre to see “Tortoise in Love”. A very funny, romantic comedy which should suit all! About a local gardener who is a bit on the slow side about matters of the heart! Almost the whole village of Kingston Bagpuize in Oxfordshire was involved in the making of the film. Let me know of possible numbers for lunch and the movies and looking forward to seeing you all there! Hello Frockers & the Stokers!! It is Autumn which means it is Vintage Time in Hawkes Bay!!! What better way to celebrate than a ride to take in the New Pathway extension out back of Park Island and ending up at Crab Farm Winery, Bayview for Lunch. Then back along the Water front to your desired finishing point. Time: 10.00 meet at Park Island, Napier for 10.15am ride time! The Annual Deco Ride is on again! Saturday Feb 18th – Bicycle Belles, yes its the annual Art Deco Weekend, which is wheelie lots of fun 😉 Meet Soundshell at 9.30am and proceed in a disorderly fashion around to East Pier for refreshements. Then return to Soundshell for a picnic lunch by the pathway. Gold Coin donation for the Art Deco Trust. So start thinking about your Deco Duds for this one – everyone is welcome. I often get asked questions about how to change a tyre – and I’m amazed how many of us girls think it’s a ‘boys’ job. Sometimes though the ‘boys’ just don’t happen to be handy so………. In conjunction with Avanti Plus Hastings we are offering the ‘Ladies’ a special bike maintenance course – just for you! It doesn’t matter what bike you have I’m sure they can enlighten you. Jamie and Jon from AvantiPlus Hastings have kindly offered to run a Bike Maintenance course just for the girls. These workshops are a great way to increase your understanding of how your bicycle works and gain confidence with carrying out your own basic maintenance. With all those summer events and summer evenings coming up what better time to! Topics covered will be: Puncture repair, wheel removal, simple cleaning & lubrication, instruction on chain breaking and repair, basic gear tuning and brake pad replacement & adjustment and any other questions/requests. DATE: Wednesday 12 Oct, 6pm WHERE: Avanti Plus Hastings, 1/401 Queen Street West, Hastings. First in first served – a maximum of 20 per course. Spring is here we hope you are enjoying our lovely Hawke’s Bay Spring – by cycling! You are all invited to the next “HB Frockers” ride. We will be following on from Ingrid’s famous French themed Rugby World Cup Ride, where she won tickets and smoozed with Tamati. We are inviting you all to meet dressed in French theme (French Knickers, Beret, French Maid or just French Chic) for a Picnic. Date: Sunday 18th September at 1pm at the Napier Sound Shell. 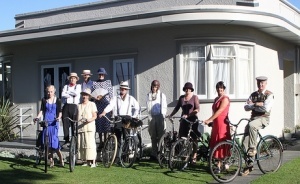 So ride your bike into Napier, meet at the Sound Shell for some French picnic fun! BYO Fabulicious French Picnic, what about a bottle of Moet, cheese, pate, grapes and chocolates ……… mmmmmm ENJOY! All to coincide with the Rugby World Cup French game that evening and Art Deco afternoon. Its that time of year again. The HB Brave at Heart Tartan & Tweed Trail is on Sunday 3rd July. Well Winter Blues need to be shaken off! So the celebration of the shortest day last week and the promise of longer days has inspired again. So Frockers get out your bikes and winter Tartan or Tweed, for the ‘Brave at Heart Tartan N’ Tweed Trail’. Yes you need to wear something tartan or tweed – a kilt, jacket, hat or just a scarf. Same ride as last year. Optional where you join in, how long you ride for or where you pop off. Where: A Napier loop: from Pettigrew Green Arena ride to Taradale, turn up Puketapu Road, turn into Church Road, proceed to the cycle pathway. Ride around Park Island, behind Napier Hill, around to Milk & Honey for a coffee in Ahuriri at approx 10.00am. Leaving approx 11.00am on the pathway to Marine Parade to Awatoto and back up to Pettigrew Green Arena on the pathway. So you can join us on the way, hope off at any stage or do the whole loop. Start/Finish: Pettigrew Green Arena, Taradale but you can choose any point to join or exit. If any of you would like to help/assist with planning rides come and see me on Sunday. See you there ‘tartans’! 3-5pm at the Hawke’s Bay Opera House, free glass of bubbles for first 200 arrivals. A wonderful show of fashionable bikes and everyday cycle clothes! Join the Bicycle Belles at Marine Parade, on pathway behind Soundshell in Napier. Join us for a leisurely cycle on the Rotary Pathway around to East Pier where you can enjoy light refreshments before biking back to Marine Parade. Old bikes and deco duds a must! Last year we had over 80 riders, some on beautiful old bikes and in Deco finery. If you don’t have an old bike just come anyway! Gold Coin donation for Deco Trust. Frockolicious Pink Cup Cake Ride! ♥ You are invited to join us on a ride and picnic to celebrate National Frocktober Day on October 16th. Bring your own picnic down the Hastings Race Course, to join us on a ride around some of Hastings Parks, before heading back to the Race Course for a Teaparty and Pink Cup Cake Judging Competition. ♥ A fantastic prize from Total Food Equipment is up for grabs. So try your hand at baking some pink cupcakes! Judges Robyn Warren from Warrens Bakery and Vicki Butterworth will be looking for the best looking and tasting Frockolicious Pink Cup Cake! Check out Total Food Equipment range for inspiration, you can find them on Bower Street in Napier. ♥ So pop on your prettiest Frock and join us for the celebrations of National Froctober Day and raise awareness by wearing Pink for Breast Cancer Awareness Month. Blossom Festival – Come join the parade! All Frockers are invited to join in the Blossom Festival Parade, on Saturday 11th Sept in Hastings. Judging of the float starts at 12.15, with the parade commencing at 1.30pm. You are all invited to join Hastings District Councils float/parade! So, if you are planning to dress up, you will need to be ready by 12.15, so in order to make life easier, we will be providing a bite to eat from 11.30am at the main admin building, Hastings District Council, Lyndon Street, Hastings. This will be on the first floor, outside the Mayor’s office. If you don’t want lunch, just make sure you are at the admin building for 1.15pm. Remember, you can come dressed as a walker or cyclist (or a famous walker or cyclist,) and bring your scooters, cycles, pushchairs, wheelchairs, mobility scooters, preferably decked out in a floral theme … so get out your prettiest spring frock, we want to show our community that walking and cycling is fun, healthy and easy! Celebrate Deco Decanted Weekend in Napier and join the Parade. Join us for a promenade of bicycles. Old bikes and tweeds a must! Course: Cyclists and their cycling machines will congregate at the HB Club on Browning Street at 10.30am. At 11.00am the parade will be the led out by a vintage truck, bikes and pedestrians will follow with vintage cars at the rear. The parade will proceed in orderly fashion along Hastings Street, down Emerson Street, finishing just outside Whitcoulls Bookshop. We encourage you to bring your bike, tweeds and enjoy the opportunity to partake in an official deco parade.This is a social and fun ride for anyone with an old bike! Well Winter Blues have set in for me. Apologies for not organising a ride last month, I got snowed under and these cold, dark, wet days are not inspiring me to get out on bike. So the celebration of the shortest day this week and the promise of longer days from now on has motivated me to organise a ride. So Frockers get out your bikes and winter Tartan, for the ‘Brave at Heart Tartan Trail’. Yes you need to wear something tartan – a kilt, jacket, hat or just a scarf. Sylvia has suggested this loop. Optional where you join in, how long you ride for or where you pop off. BOOK THE BABY SITTER GIRLS! For those who would like to finish riding down and not up, some will be meeting in the carpark behind the Havelock North Info centre and riding up to Black Barn (approx 5k), leaving from 4.30pm. It is recommended you dust off the dynamo and put on your lights – the delights of autumn evening riding. For those who would like to partake in the Avanti Plus Girls Weekend Ride on Sunday April 11th – A fundraiser for New Zealand Breast Cancer Foundation and Bike HB – there is the 20k Roadsafe Funride and 65k Black Barn Challenge. Check out events page at www.blackbarn.com to enter or for more details.